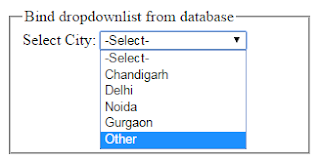 Introduction: In this article I am going to share how to bind dropdownlist from sql server database and insert an item at top or append an item at bottom in dropdownlist along with data from the database in asp.net using both C# and VB. Description: Adding an item e.g. "-Select-" at first position in dropdownlist is very common requirement and easy but while working on project I got the requirement to append an additional item e.g. "Other" in databound dropdownlist at the end of all the other items populating from database. It was as easy as inserting an item at first. We just need to count the items present in dropdownlist and insert the desired item at that location. Thanks ashish for your valuable comment..Stay connected and keep reading more updates..